The week flew by and I'm ready for Christmas in the sense that the only thing keeping me from stressing out is the idea that I get to sleep in my own bed and sleep in when the weekend arrives. As has become our habit, we aren't going Christmas until New Year's Eve and that will be down in Indiana at jebra's brother's house. 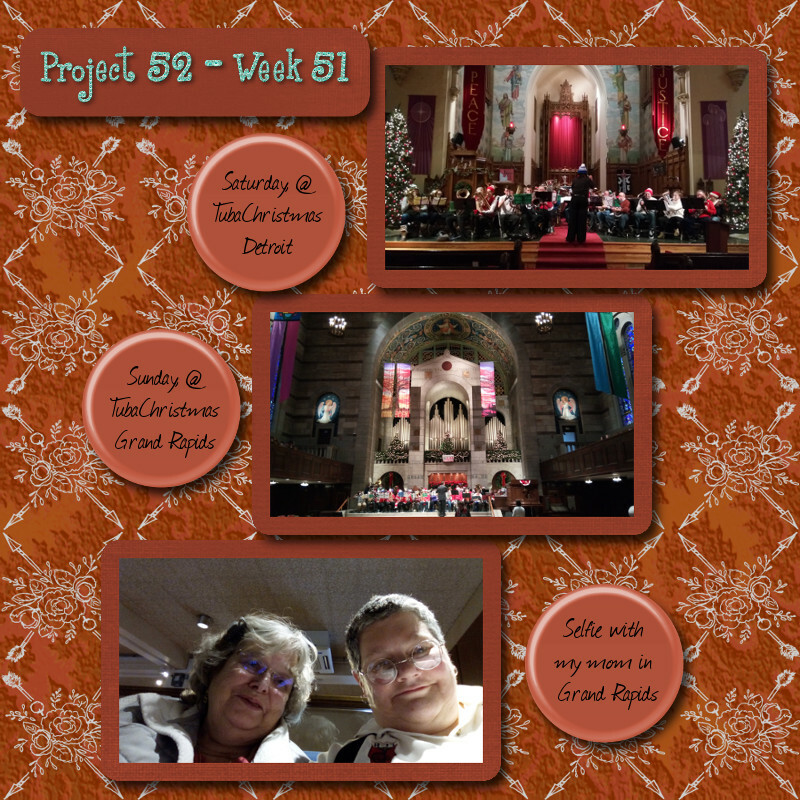 We were at home last Friday night too, but as we had to get up at the usual time to get ourselves to Detroit for the TubaChristmas rehearsal, I started the weekend tired. Not to mention I was up late washing stuff for Saturday and Sunday and getting 99% of my packing done. As usual, I enjoyed the Detroit TubaChristmas concert and enjoyed looking around at the surroundings as we drove in and out of the city. We were also amused at the large number of parking attendants trying to entice us. $40 for parking since the Lion's were playing football that afternoon. $40 seems like a lot of money to me and I was very glad that parking at the Church (which is right across the street from the stadium) was free for people attending church events. We headed to Ionia when the concert was over, arriving at my mom's in the early evening. We hung out with her watching Christmas movies on ION Television (and holy cats was was A Christmas Cruise lame and not very funny). In the morning we got up, had breakfast, packed the music instruments back into the van and drove to Grand Rapids. Mom and I expected to spend the time jebra was at rehearsal shopping the church's annual rummage and antique sale. We were thwarted in this because there were no sales this year. Instead we toured the church's little art gallery and then went up to the balcony level to sit in the lounge where the homeless gather during the day. There were probably a dozen guys up there; two looked to be in their early 20s and from their actions I gather are brothers. The only one who really stood out was the guy with mental health issues. He spent a lot of time singing quietly to himself and talking to the artwork on one of the walls. The concert was very good, turn-out for it was probably the best I've seen this year, and when it was over we got to go to my favorite Turkish restaurant in Ada. Besides being my favorite, this is also the only Turkish restaurant I know about anywhere, let alone in Mid-Michigan.Zeytin is what it is called and if you find yourself near Ada, I highly recommend stopping in for a meal. After dinner we took mom back to her house and said our farewells. She left for my sister KC's house yesterday and will be in the Carolina's for Christmas. She'll actually be down there for a full month, giving my brother Rob and his wife Diana a chance to relax from doctor's visits and general worry about her. Her memory is still wonky and she's obviously distressed that she can't work or do many of the things she used to be able to do. Like get in the car and go somewhere. She doesn't know if a complete recovery is possible and she expressed worry that family members are trying to shield her from an honest assessment of her chances. I don't know what they are as no one is telling me anything either. This entry was originally posted at https://mrs-sweetpeach.dreamwidth.org/955227.html. The homeless break my heart. I'm glad they have a place to go with that church. It's nice they do that. Sorry to hear about your mom. I hope that she is able to recover - at least enough to do more and make her feel happier.